A man died after he walked on to the M1 and was hit by a car shortly after he crashed his own vehicle. Police said a car went down the embankment between junctions 20 and 21, southbound, in Leicestershire, just before 01:15 BST on Sunday. The man was taken to hospital afterwards and later died. 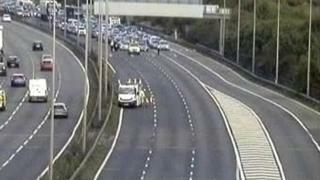 The M1 southbound was closed for several hours and re-opened at about 10:30 BST. Police have appealed for eyewitnesses and dashcam footage.